Each Milk & Honey disc contains moisturizers, cleansers, and provides aromatherapy. The ingredients inside the large leaves such as, Kinetin, and Squalene Olive provide essential oils to soak into and hydrate the skin. They also release powerful antioxidants into the water to protect the skin from damaging free radicals like pollution. Deodorizing Lemongrass and White Tea Tree Oil come in the small leaves and work to clean and refresh the skin for strong, but gentle cleansing benefits. Lastly, an effervescent tablet comes with Chloramine-T, White Tea Tree Oil and Thymol to kill off bacteria and fungus and prevent cross-contamination. 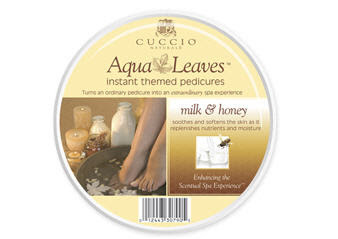 Every disc of Milk & Honey Aqua Leaves come with 2 large moisturizing leaves, about 6.5 grams of small cleansing leaves and an effervescent tablet.